MAISON ABLE Cafe Ron Ron in Harajuku is the first place in Japan to combine all-you-can-eat sweets with the concept of conveyor belt sushi. We will introduce you to the adorable looking food available as well as its unique concept. MAISON ABLE Cafe Ron Ron in Harajaku combines the fun experience of conveyor belt sushi with cute and delicious all-you-can-eat sweets. With both of these concepts being extremely popular for many years, it was only a question of time before they would meet. In this article, we will introduce you to the result of this combination, the cutest sweets go round in Japan. Cafe Ron Ron opened its doors in Harajuku on July 16th, 2018. As of now, it is the only all-you-can-eat cafe of its kind. 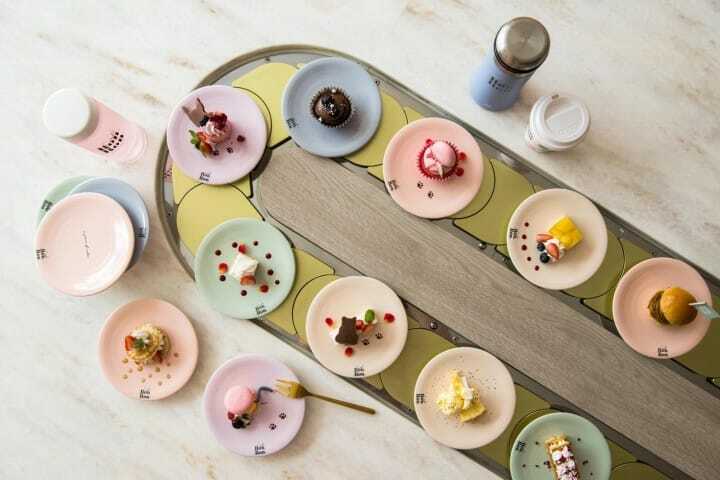 The interior is inspired by fancy French cafes and held in pastel colors which includes the dishes that hold the desserts. Visitors are seated around a big table and the thirty-five-meter conveyor belt in the middle transports the small treats around the restaurant. Conveyor belt sweets work the same way as the sushi version, if you like something you see, you simply take it. You won't be charged by the dish. Everything on the conveyor belt is included in your all-you-can-eat charge. The dishes are prepared in batches and evenly distributed on the conveyer belt so you can't order single items. Make sure to take whatever captures your interests right away before it might be gone in the next round. You can find a variety of adorable miniature sized sweets at Cafe Ron Ron. Most of them are inspired by the sweets that are popular around Harajuku. One of these items is the famous Japanese crepe. Japanese crepes are usually filled with whipped cream, cake, ice cream or fruits. There is an abundance of crepe shops in Harajuku which is why they are also known as Harajuku crepes. The mini version at Cafe Ron Ron is filled with whipped cream and fruits. Maybe you could combine it with one of the small cakes to make the perfect mini Harajuku crepe? One of the most adorable items on the menu must be the tiny dango (sweet Japanese rice cakes). Each little rice cake isn’t much bigger than a marble. You could eat it all at in one bite or enjoy each color one by one. Even though Ron Ron's sweets are miniature-sized they take great pride in the fact that all of them are just as delicious and high quality as their big counterparts. The reason why they are so small is that they want you to enjoy many different varieties without feeling full after three or four dishes. And let's be honest, it is also because they just look extremely adorable this way. You might already have spotted that some of the sweets come with cute edible cat shaped decorations. Cafe Ron Ron is named after the sound a cat makes when it's purring. In French that sound is ron-ron. This is the reason why you will see a couple of cat-themed items passing you by on the conveyor belt. Sometimes whole cat shapes are attached to the dishes other times just tails or pawprints. This cute macaron, for example, is cotton candy filled and has an edible cat tail attached. The plate is also decorated with tiny cocoa paw prints. It is almost too cute to eat. If you would like something savory before, after or in between your sweets you will be pleased to know that ten out of the thirty-five items Cafe Ron Ron offers are savory. The one pictured above is a yakisoba (fried noodles) filled mini bun known as yakisoba pan. This tiny version is the perfect trial size for the popular Japanese sandwich choice. This might look like ice cream but it is potato salad in an ice cream cone. The crunchy ice cream cone goes well with creamy potato salad. They even have miniature nikuman (steamed buns with meat filling). However, there is a version with a sweet filling that looks very similar as well. If you want the nikuman, in particular, you should pick the one with the twist on the top such as in the photo above. Other savory treats include egg sandwiches, quiche, and potato chips. The all-you-can-eat service includes one drink. You can choose between a variety of hot and cold drinks including coffee, tea and even rose water. Please don't take the bottles out with you. They are only meant to be used in the restaurant. Once you finished your free drink you are welcome to buy another for 500 yen at the ticket machine. This lemon water is complimentary so please feel free to have some with your food as well. You can find it besides the other beverages. If you enter the cafe you will see the ticket machine to your right. The choices are written in Japanese and English and very easy to understand. The forty-minute all-you-can-eat course at Cafe Ron Ron costs 1800 yen. If you have LINE Messenger you can add Cafe Ron Ron and get 100 yen off the total price. Here you can also buy a ticket for one more drink. If you have any food allergies you can press the allergy button and let the staff know. They will show you a menu containing possible allergies which is also available in English. If you like the concept of conveyor belt sushi as well as cute and delicious desserts and snacks you should definitely give Cafe Ron Ron a try. Forty minutes seems like a short time but since you just have to take the sweets from the conveyor belt instead of waiting for them it is really plenty of time to get full and satisfied. Why not try conveyor belt desserts instead of sushi for lunch next time you are in Tokyo? Blue Seal - Okinawan Ice Cream And The Best Japanese Crepes In Tokyo! Max Brenner Chocolate Pizza Bar in Harajuku - Custom-Made Desserts!